Hardly any of Extinction Rebellion's protests involve releasing infected monkeys. That drunk driver bloke Guido has found photos of the Extinction Rebellion lad skiing so have declared him a massive hypocrite. The copper's putting surgical gloves on. He's got loads of abseiling gear, it must be a crack climbing BTP squad. A copper with a ladder's turned up. 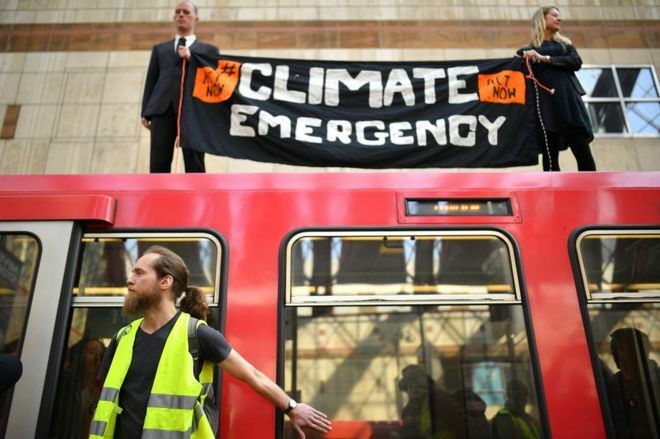 Extinction Rebellion have glued themselves to a DLR train roof.